Ozeki Cooking School welcomes students from around the world to Seki, Gifu—a historic town renown for samurai swords and cormorant fishing. Throughout the four seasons, cooking with Chef Shuji can take you into the luscious bamboo forest, over to the serene rice paddy, to the rushing Nagara river, and back to the 100 year-old Yamakyu Restaurant, where all the culinary delight takes place. Master Chef Shuji combines 35 years of professional experience with a holistic and mindful approach, resulting in a masterful yet harmonious Japanese cuisine. Traditional Japanese cuisine, has been gaining worldwide popularity in recent years and in December 2013, washoku was granted the UNESCO Intangible Cultural Heritage designation. Japanese home-cooking is centred on the happiness and health of the family, combining a focus on wholesome and balanced nutrition with precise and symbolic aesthetic conventions. Not only is Japanese cuisine nourishing, vibrant and elegant; it is often easy to prepare on an everyday basis. Whether you’d like to learn about Japanese home-style cooking, healthful and convenient obento, mindful zazen, Japanese tea ceremony, or traditional rice cultivation—enroll in one of Shuji’s workshops or set up your own private cooking class. 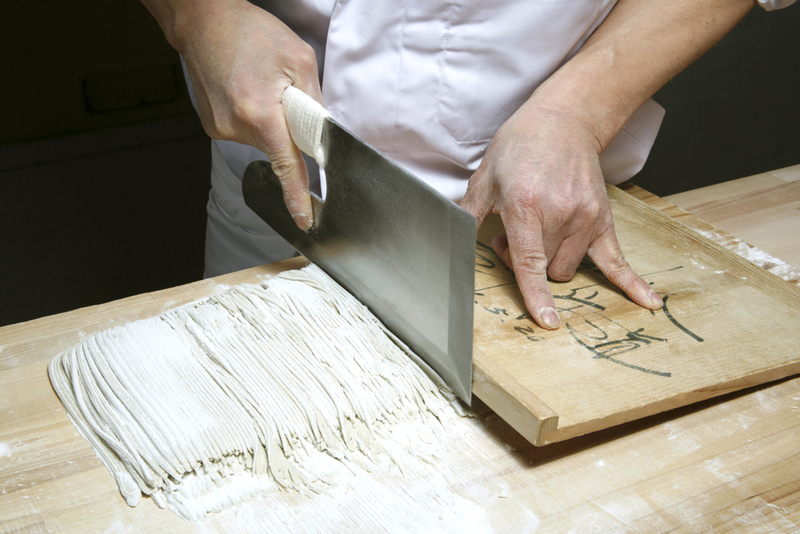 Chef Shuji caters to individuals and groups of all sizes, taking care of each detail from start to finish. Choose from Shuji`s wide selection of workshops and cultural activities to create a memorable, personalised culinary adventure. Learn more about Shuji’s unique approach or browse his class offering. Most chefs might say that good food begins with good ingredients. And they'd be right. But as Shuji explains, you first need good water to grow those ingredients. Such is the perspective of a man who prioritises a holistic and quality-oriented approach to the art of Japanese cuisine. Good water means good soil; which in turn produces healthy, flavourful vegetables—and ultimately tasty food. Over the past 35 years, Chef Shuji Ozeki has accumulated extensive cultural and culinary knowledge which has resulted in his own unique, holistic approach to Japanese cuisine. For over three decades Shuji has been a practicing Buddhist, applying Zen philosophy to everyday life—thereby fostering his health, well-being, sensibility, physical and mental strength, as well as polishing his five senses. It is Shuji's belief that in order to create impressive dishes, any master chef must be in good health—physically, mentally and spiritually. Shuji consistently keeps up his practice through the art of Aikido and Zen meditation and strives to remain in a constant state of mu (pure human awareness, free of dualistic thoughts). His dedication to mindfulness in all areas of life is reflected in all that he does and is especially evident in the harmonious dishes he prepares. "Whether cutting vegetables, filleting fish or rinsing rice — I must be 100% present — focused and mindful of every task." By tuning in to the moment, harmonising his body and mind as one, Shuji is able to make dishes in which you can taste and feel the difference. This is the distinct, irreplaceable ingredient that makes Shuji's cuisine unique and unforgettable, and fuels his passion to introduce the world to simple, healthful and tasty washoku. Although rooted in tradition, Japanese cuisine is constantly evolving. In order to remain current and to keep developing his culinary skills, Chef Shuji continuously visits other top chefs throughout Japan to sample their cuisine. By consistently building his culinary archives, when it is time to cook, he pulls from his mental repertoire and applies this knowledge in his own way to create novel, innovative dishes. Shuji tirelessly works at perfecting new recipes, challenging his taste buds to pinpoint subtle flavours and seasoning combinations. Only when a recipe has been perfected, will Chef Shuji add it to his portfolio.